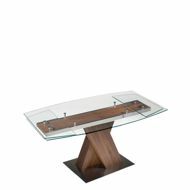 The BOSTON Dining Table features a walnut base, brushed steel, and a thick glass top. 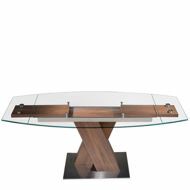 This combination of materials allows this glass dining table to be unique in its category. 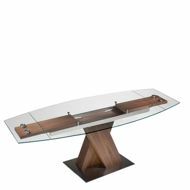 The cross walnut beams offer a sturdy aesthetic and a strong base. 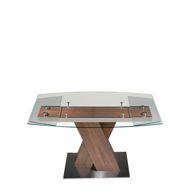 Additionally, this dining table also features two built-in 16" extension allowing for extra seating when needed and no storage space for the extensions when it's not needed.